This is our precious Lydia. She’s an amazing young girl who’s been blessed with good health overall. She likes to play and interact with others, but she’s also contented when she’s by herself. Though her verbal skills are not yet fully developed, she can say simple words and her vocabulary is growing. She is an expressive young lady and has an infectious giggle when something truly tickles her funny bone! She has shown a special love for horses and has greatly enjoyed riding and just being around the majestic animals during therapy outings. Lydia likes to participate in all kinds of hands-on activities. Her greatest joy would be to share in the day-to-day happenings and the love of a forever family of her own. 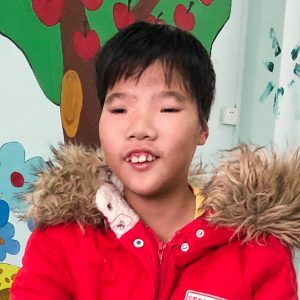 Lydia is about to become a teenager, and then when she turns 14, she’ll no longer be eligible for adoption under China’s adoption laws. Time goes so fast, but you can help us in our mission to find Lydia’s Forever Family. Please share her story and photos! For more information about Lydia, please contact us.